Acne can have a serious impact on your confidence. As someone with acne-prone skin, I'm always looking for the best products and practices to keep my skin looking clear and glowing. I've tried SO many acne products at this point, so I'm excited to share some of my very best tips for keeping your skin looking amazing in today's post! One of the greatest things you can do for your skin is stay hydrated! Your skin needs water, and if you aren't constantly drinking water to stay hydrated, your skin won't be looking it's best. Not only is drinking water great for flushing out the toxins in your body to prevent acne, but it's also great for creating a glowy, dewy complexion. Who doesn't want that? 2. Use a cleanser that targets acne. If you have acne-prone skin, it's important to use a cleanser daily that targets acne. Typically, I'll use a really gentle cleanser in the morning and I'll use the ZAPZYT Acne Wash at night to really clear out my pores and prevent/heal any current breakouts. If I'm having a really bad time with my skin, I'll make sure to instead use the acne wash twice a day to get rid of those breakouts. 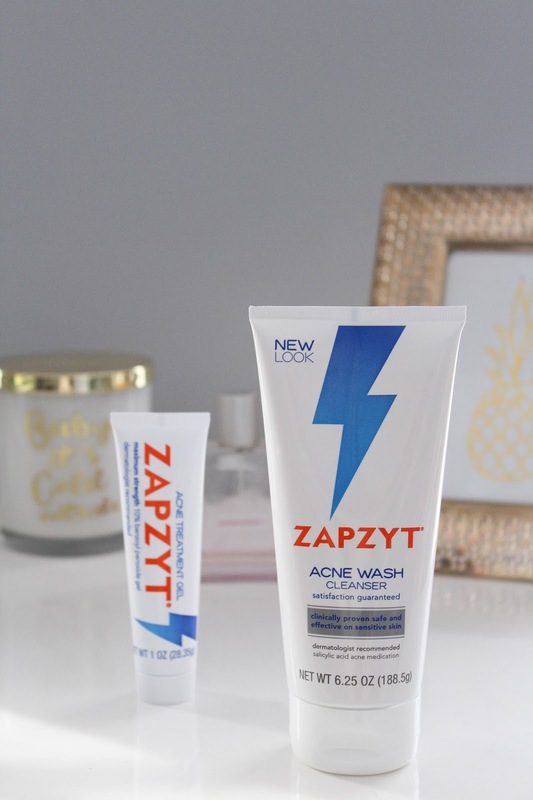 I've noticed such a huge difference in my skin since I started using the ZAPZYT Acne Wash on a regular basis! 3. Keep your hands OFF your face. This is a tip that seems obvious, but you'd be surprised how many people sit at their desk at work or sit in class with their hand pressed up against their face! I always notice acne in the places that I tend to touch on my face, and since I've really started paying attention to my face touching habits, I've noticed my acne has really calmed down. I know it's impossible to NEVER touch your face, but try to make it a point to keep those hands off, and if you do need to touch your face at some point, make sure your hands are clean. Spot treatment is essential for someone with acne-prone skin. Using a harsh acne lotion all over your face can often irritate sensitive skin, so they best way to fight breakouts is to spot treat them with a great product. 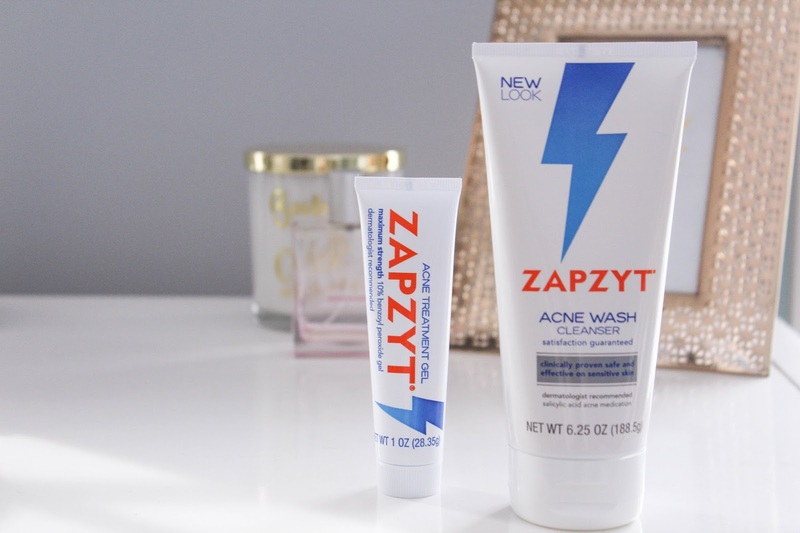 I'm loving the ZAPZYT Acne Treatment Gel from WalMart for a few reasons. This product is so different from competitors and is truly one of the best spot treatments out there. The acne gel is water based rather than alcohol based, and contains absolutely no alcohol! Alcohol in acne products can honestly just worsen the problem and cause more redness to already irritated skin. 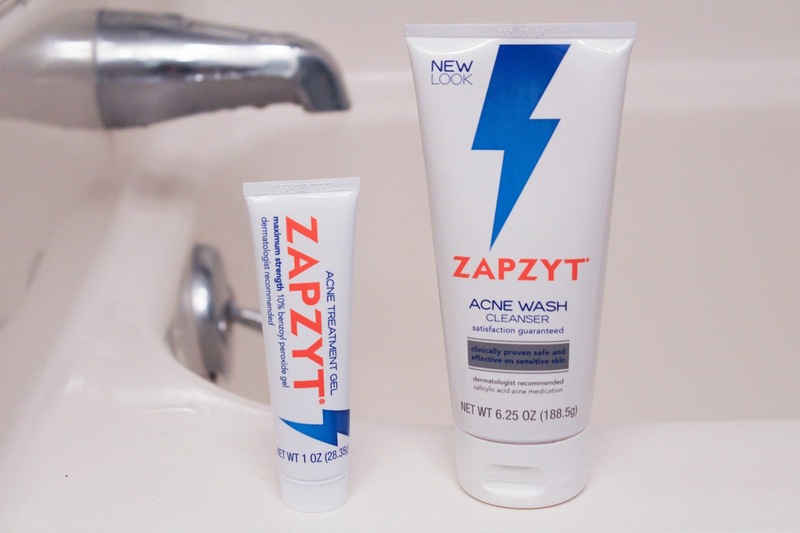 Everyone gets those pesky problem zits sometimes, and ZAPZYT Acne Treatment Gel is the perfect solution! I love using this on a zit that pops up because I can put it on in the morning and the spot is already less red and inflamed as the day goes in. Within just a few days, the spot is completely gone and no scar is left behind! 5. Never, ever pop a pimple! Popping pimples is so, so bad. Not only does it irritate the skin even more, but it can leave a scar behind, and nobody wants that! Acne scars can be so hard to get rid of, and popping a pimple only increases your chances of having one of those annoying little marks. It can be tempting, but just remember that it's not worth it, and while the pimple is annoying now, it should be gone soon as long as you treat it ASAP with some ZAPZYT Acne Treatment Gel! What are your BEST acne hacks? It sounds gross, but my mom taught me this when I was a teenager and it works wonders- when you wake up in the morning, rub your spit onto the pimples. Saliva is highly acidic, especially in the morning, which dries out pimples really fast. Also, it's free! Wow how strange! 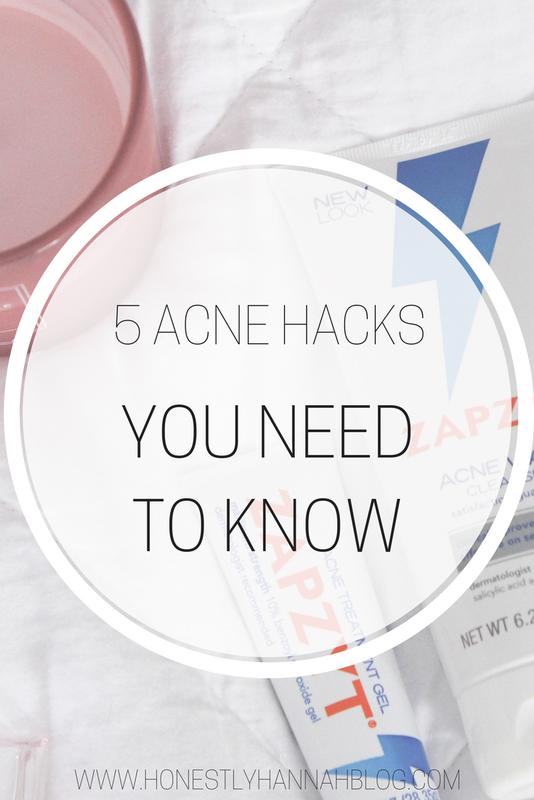 I feel like there's so many weird acne hacks out there that actually work! Toothpaste for example works really well.. so interesting! Great Post!! I had faced the problem of acne in my adult age. Acne is truly a problem faced by every individual and for that I had started using dermology acne treatment and it had worked great and I would love to recommend it to every individual. Nice article! Thanks for sharing such an informative information, the product seems really good. I too suffered from acne , I recovered it with revitol acnezine cream. Since revitol acnezine cream has come into the market, the treatment for acne has become easier and less expensive. By using this product you can remove those bumps or pimples appearing on your face. It's a must try! Zapzyt looks quite the treatment would love to give it try soon, however, I still have doubts about its effectivity. Would definitely ask a physician before using this acne scar treatment. Great review! 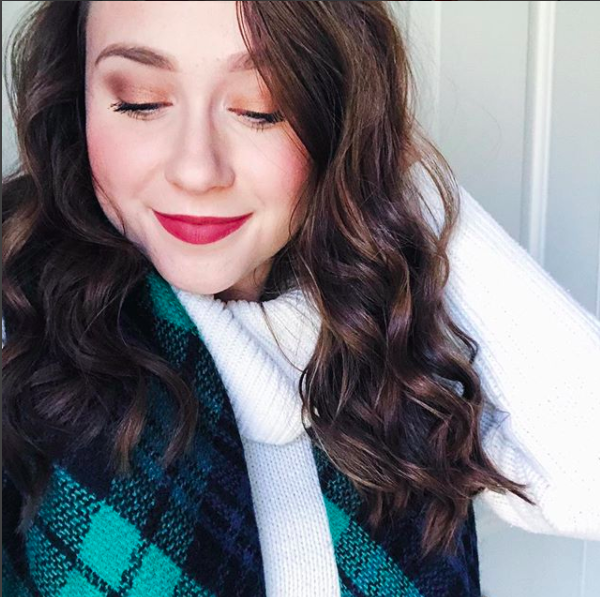 Thanks for sharing your beauty discoveries! I also have sensitive skin and acne. My beauty regimen includes scrub and a mask twice a week. Also it's necessary to make it a habit to moisturize your skin every single day! And make sure you are always washing your face at night after using makeup.